Armed clashes between pro-Russian militias and Ukrainian military continue in southeast Ukraine as the country reacts to tragedy in Odessa. The city of Odessa has declared May 3-5 days of mourning, according to a message posted on city council website. On May 2, more than 40 people were killed in the Black Sea city. Most of the dead were supporters of Russia and federalization who were trapped inside the local Trade Union House after it was set on fire by members of the ultranationalist Right Sector political party. The fire followed a day of street clashes between pro-Russian and pro-Ukrainian groups. Russian daily Izvestia reported that the Federation Council, the upper house of Russia’s parliament, has called for an international commission to be set up to investigate the events in Odessa. Andrei Senchenko, the acting deputy head of the Ukrainian presidential administration, has not ruled out the arrest of senior police officials in Odessa, who were involved in "preparing acts of provocation" in the city on May 2. "I think all the branches of power, all the levels of power will be brought to account, all those who allowed what happened in Odessa to happen, who failed to act on time, which resulted in the Odessa tragedy," Senchenko told Ukraine’s Channel 5 television. Overnight, Muscovites brought flowers and candles to the Ukrainian Embassy to commemorate those who were killed in Odessa, Kramatorsk and Slavyansk on Friday, according to Russian website LifeNews. Tensions continue to increase in Slavyansk with shots fired late on Saturday evening on the outskirts of the town, according to eyewitnesses who heard sounds of artillery fire. Russian newspaper Komsomolskaya Pravda reported that residents are bracing themselves for an operation by the Ukrainian army by stocking up on basic food items. According to Russian news agency RIA Novosti, pro-Russian activists in Slavyansk expect an assault imminently as a response to the release of foreign military observers from the OSCE. 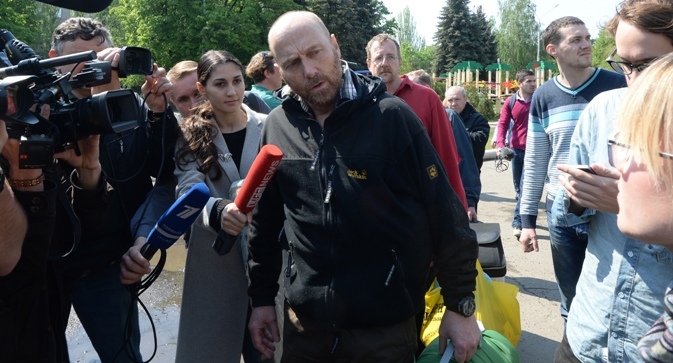 The observers had been captured by pro-Russian militiamen more than a week ago. Pro-Russian activists continue to guard checkpoints around the city. Russian Foreign Minister Sergei Lavrov has urged Ukrainian authorities not to launch a new assault against Slavyansk following the departure of the OSCE observers from the city. In a telephone conversation with his German counterpart Frank-Walter Steinmeier, Lavrov expressed concern at reports of preparations by the Ukrainian army to storm a number of cities in Ukraine's southeast, and urged Kiev to not allow the European observers' departure from Slavyansk to be interpreted as a signal to attack and repeat the bloodshed perpetrated in Odessa, according to a statement released by the Russian Foreign Ministry's press and information department. For his part, Steinmeier thanked the Russian side for its assistance, in particular the role of Russian presidential special envoy Vladimir Lukin, in the freeing of the European representatives. In Kramatorsk, pro-Russian self-defense forces control only the central quarter of the city; the rest remains in the hands of military and security forces loyal to Kiev, according to a Kramatorsk militia leader named Ivan who spoke to RIA Novosti. Ivan added that the city was currently quiet, but that the local militia was preparing for a new assault on their positions. So far one militiaman has been killed in fighting there.